I don’t believe in ghosts. I think this ironically played a large part in why I wanted to write about them, to see if I could make my own tale convincing. I love ghost stories, actually, and a number of them have terrified me despite my disbelief. Conduits is essentially a ghost story too, but with a quantum mechanical twist. And while QM does not explain or verify the existence of ghosts, it’s a lot of fun to play with when you’re writing about them—as long as you understand its basic principles. The first law of thermodynamics states that energy can neither be created nor destroyed; that’s the conservation of energy. Ghost hunters routinely misinterpret this law by assuming that when one dies, his or her electrical energy remains in spiritual form—since it can’t be destroyed—and manifests as a haunting. This is exactly the interpretation I used in Conduits to explain the ghosts’ existence, as well as how they can travel through electromagnetic channels including brain waves. In reality, as Skeptical Inquiry editor Benjamin Radford has explained, the energy is shut off when its source dies, and stored energy is released into the environment as heat during the process of decay. Bacteria, worms, etc. absorb that energy when they eat us. Those who are cremated release energy in the form of light and heat. No lingering spirit energy, unfortunately, and thus no ghosts. Science explains other classic forms of paranormal activity as well. Hypnagogia, for example, is the transitional state from wakefulness to sleep, and it is not uncommon while in this state to experience hallucinations and “sleep paralysis”, both typical of alleged haunting activity. No coincidence that many who have lived in or spent time in “haunted” houses often begin their stories with “I was lying in bed one night…” I frequently experience hypnagogic hallucinations in the form of sound—“exploding head syndrome,” not nearly as unpleasant as the name implies—in which I hear voices, buzzing, crashes and booms, and on occasion I even hallucinate being touched. It can be frightening if you don’t understand what is happening, but it does have an explanation. I think we’ve all sensed at one time or another that someone/thing was watching us as well. Hallucinations and paranoia often attend high electromagnetic fields, but the origin of high EMF fields isn’t a mystery; it’s just your large electrical appliances and water lines. I fully admit to abusing the first law of thermodynamics and other physics principles in order to serve my own selfish purposes. My narrator is meant to be unreliable and does not have a firm grasp on science (or reality, for that matter). That said, I don’t blame people for wanting to believe in ghosts. Most of us wish we could see a deceased loved one just once more—I know I do—or that something of ourselves remains after death. Personally, I just hope that if science ever does discover the existence of ghosts, they’re much nicer than the ones that inhabit Conduits. 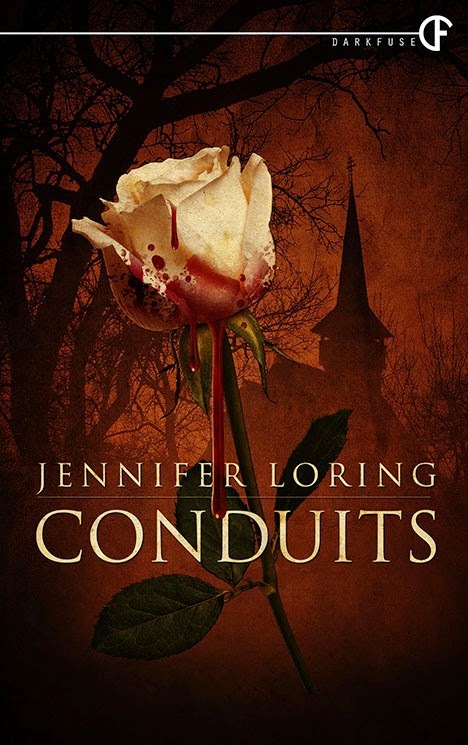 Bio: Jennifer Loring’s short fiction has appeared in numerous magazines and anthologies, and she is signed to a four-book deal with Permuted Press. Her debut novel, Those of My Kind, is due out in October 2015. Jenn is a member of the Horror Writers Association and the International Thriller Writers, and she holds an MFA in Writing Popular Fiction from Seton Hill University. Jenn lives in Philadelphia, PA, with her husband and a turtle named—what else?—Ninja. Her latest book, the novella Conduits, was published by DarkFuse and is available on Amazon.com. Already suffering from dreams of a strange, ghost-infested house in the woods, Mara begins to question the very existence of reality. She is forced to confront the truth about her older sister's death and the reason the ghosts have chosen her as their conduit.